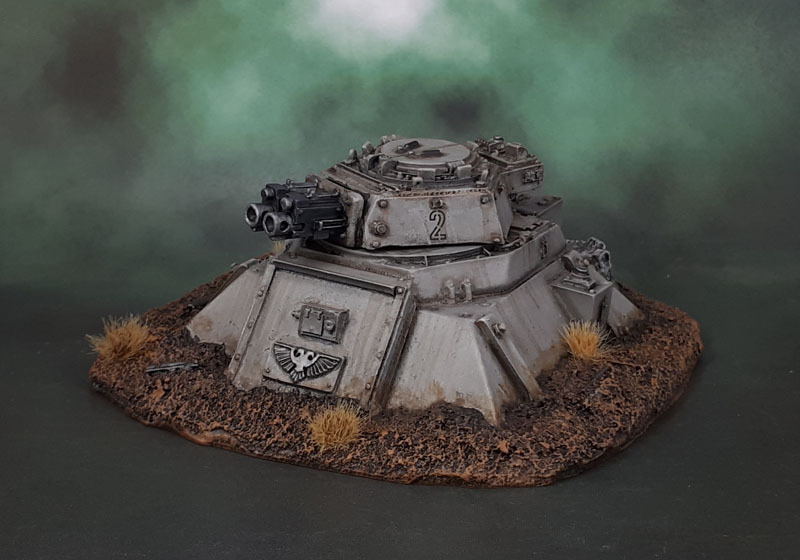 Forge World | Azazel's Bitz Box. Here’s a trio of models that I’ve had for a very long time. 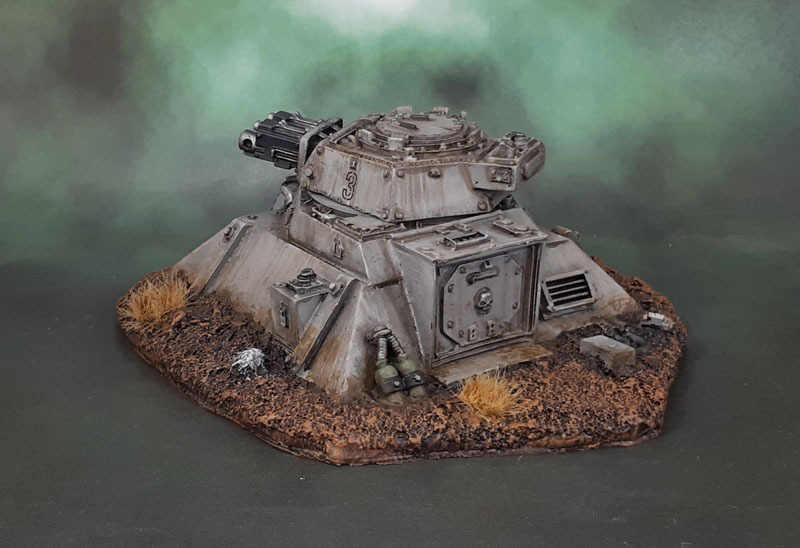 These Forge World turret emplacements had been sitting in my collection unpainted for many years intl 2016 or so, when I started painting them in a military green, with desert setting bases. I was …unhappy with how they were shaping out, so – as so many things end up doing – they just sat uncared for in a box for another couple of years. 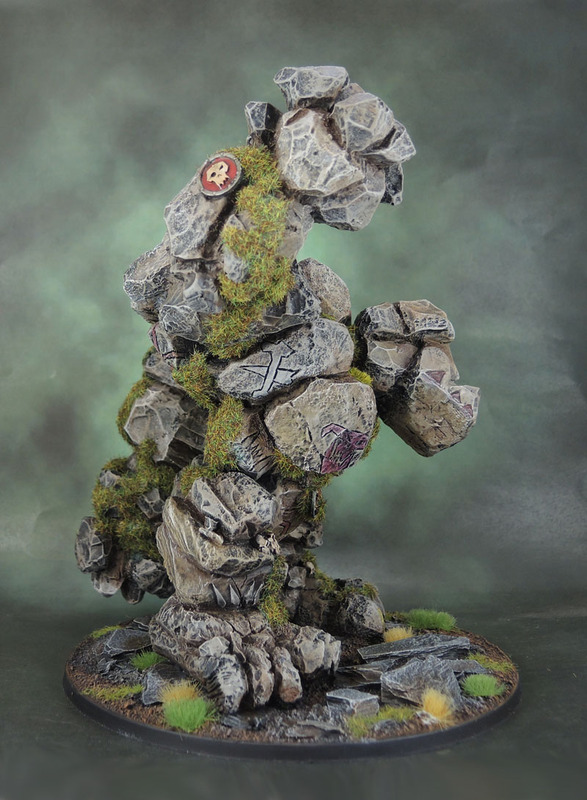 With my challenge for this month being terrain, I found them and knuckled down to give them the paint that they deserve. That paint is actually pretty plain. I went with spray-can mid-grey, followed by a bit of a lighter drybrush. 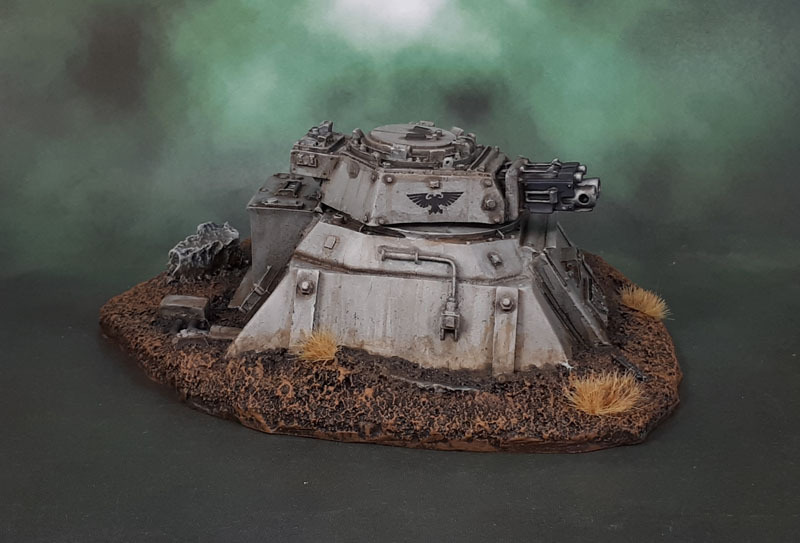 Added some German WWII stencilled letters and some Aquilias for decals, then some Vallejo washes – first a mix of dark and mid-grey, then “European Earth”, going for a rain/moisture-streaked look on both. Bases drybrushed in my usual “dark earth” manner. Followed that up with some powder (Dark Sienna) and we’re done. Amusingly, these models are now so old (and discontinued) that there aren’t any current rules for them. 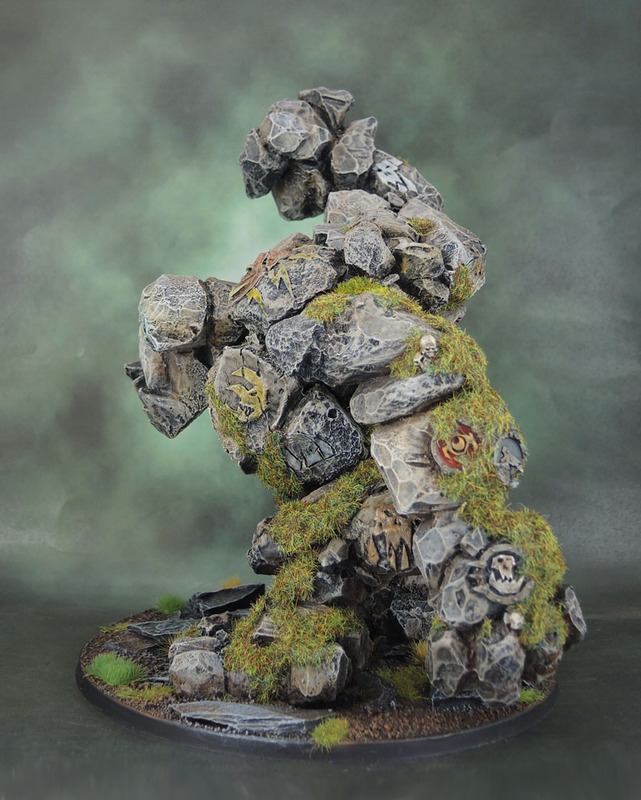 Not even any rules in the 8th edition Forge World Indices. 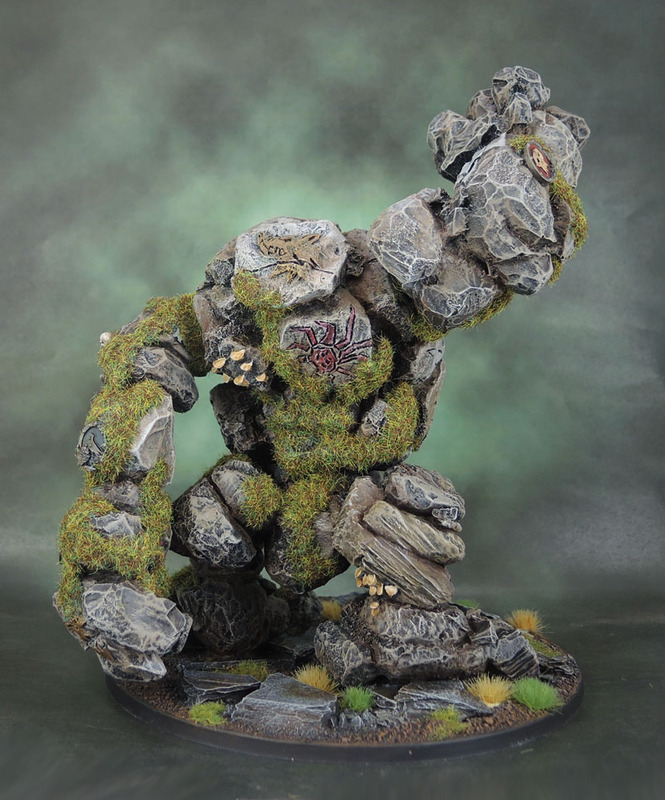 I guess I can use the rules for Tarantulas if I need to, though I’m also the kind of guy who will just use them for terrain as well. Hence their inclusion in this month’s challenge! 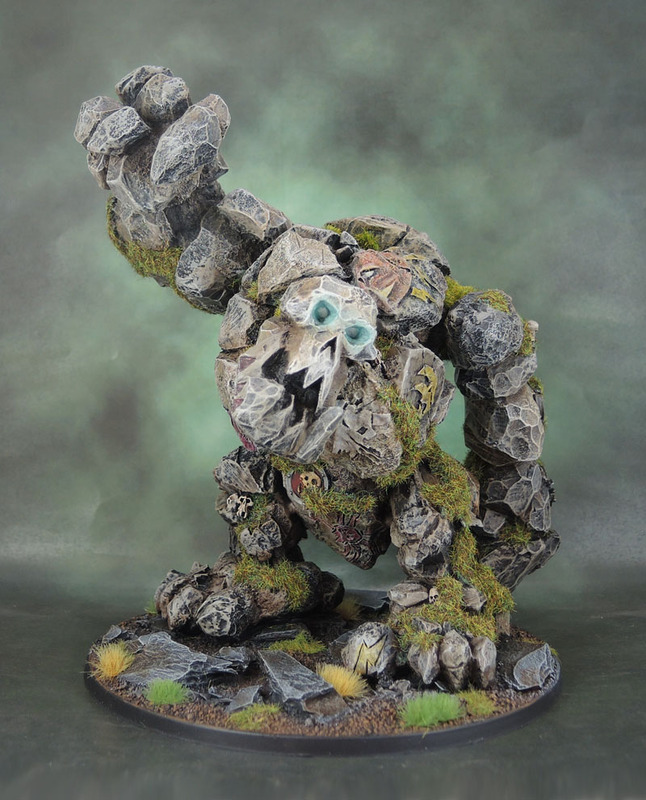 Back to Nurgle again today. Finally. 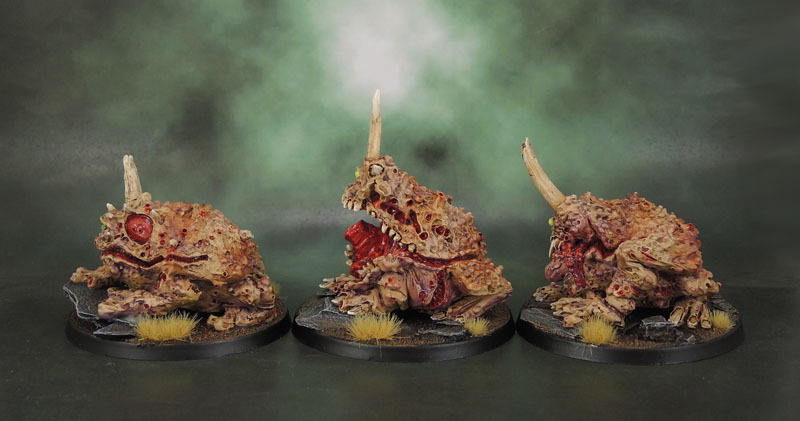 A second trio of Plague Toads. 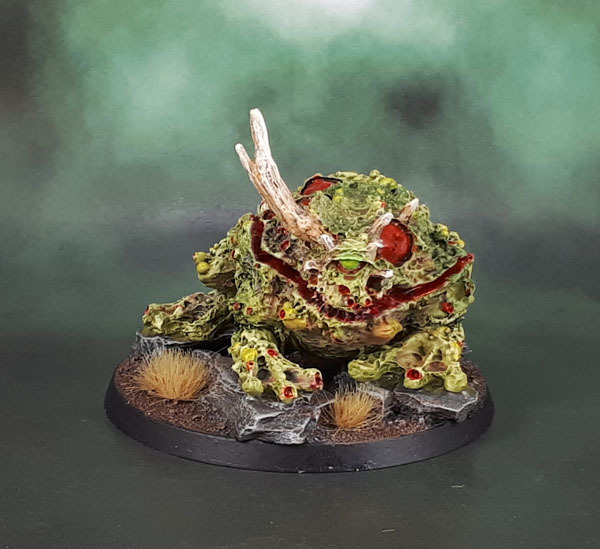 Even though it’s been almost exactly two months since the first trio that I shared, I actually started on all of my Plague Toads at once, I just ended up splitting them off into their overall colours, and so the “brown” ones got finished first, and now, finally, I’ve finished the “green” trio. These are some really nice models, really – but so very busy, especially when compared to the smooth lines of the new plastics. 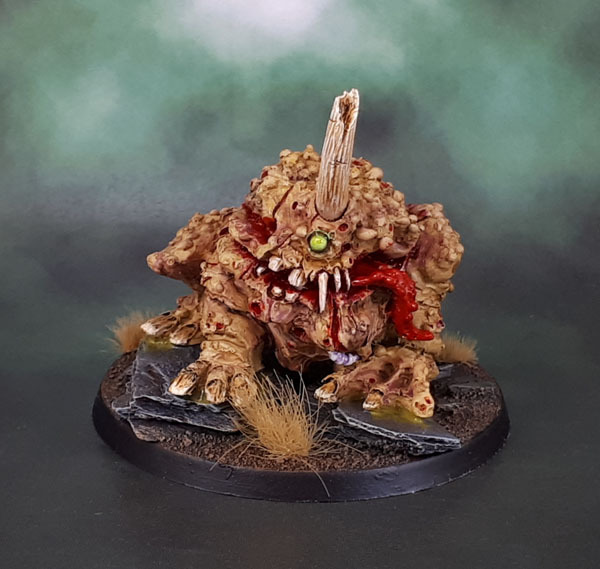 I’ve got a few more old-school metal Nurgle models still to assemble and get through before I go onto the plastics, though – as well as a bit more resin and a couple of extra surprises that I’m already working on. As with the brown trio, I gave these green ones some broad stripes of darker green across their backs, the rear view being where they stand out the most. 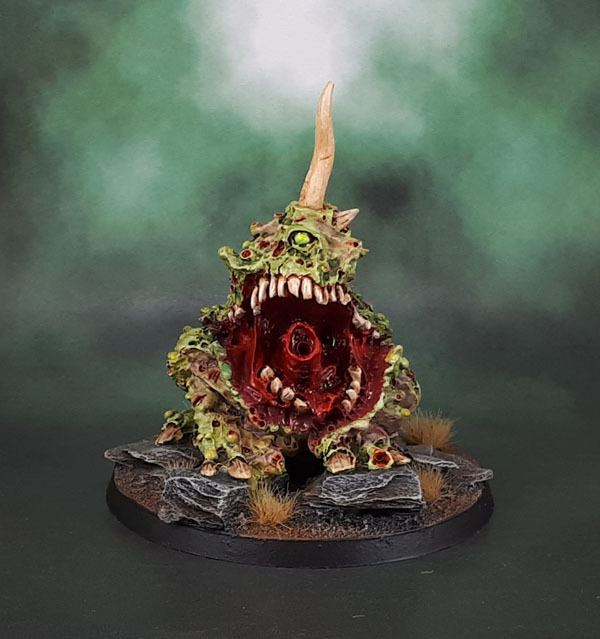 I felt that it gives the green a bit more depth and makes these unnatural, daemonic beasts look that little bit more “natural”. I also ran some thinned purple and yellows through them in various places – again to vary their flesh tones that little bit. Now here’s some individual portraits of the three of them – I’m basically out of words, so enjoy the photos! 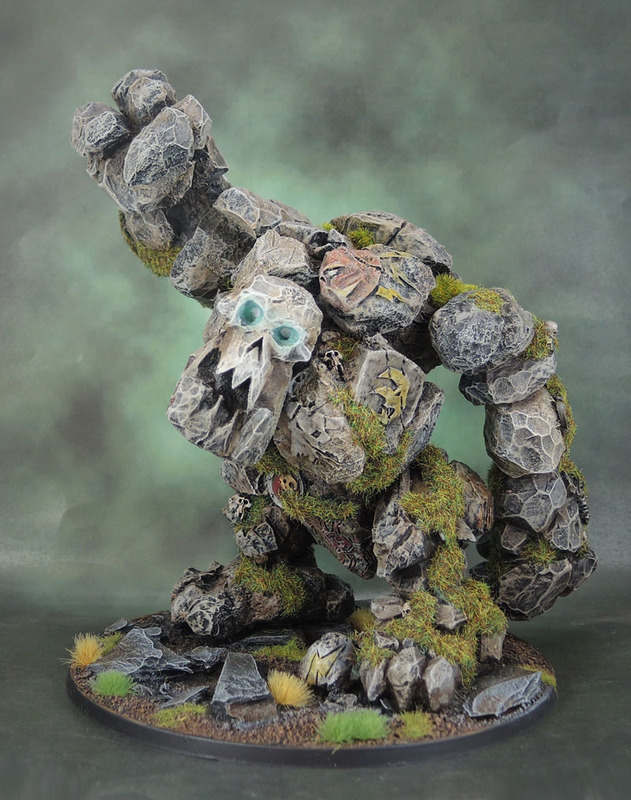 Back to the Nurgle Daemons today. It’s been awhile, I know, but these three have been a slow march, mostly because other stuff keeps taking their spot in the queue. Now, finally though – it’s their turn to shine! Or glisten. 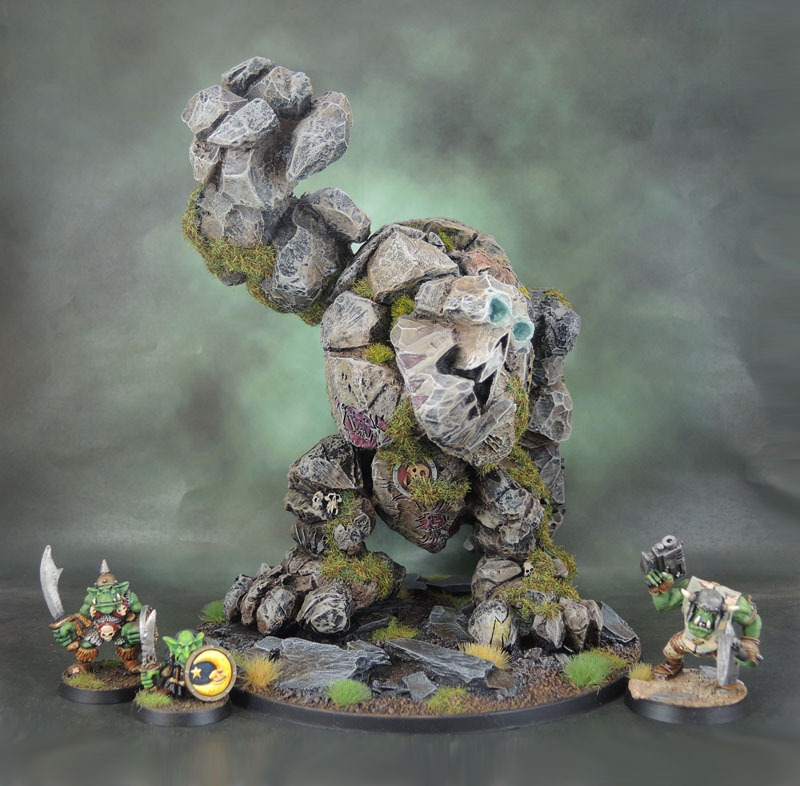 I’ve actually had these Forge World resin models for years now, but like so much in my collection, they were bought because I wanted them to eventually paint up for [army] and then they just sat there. 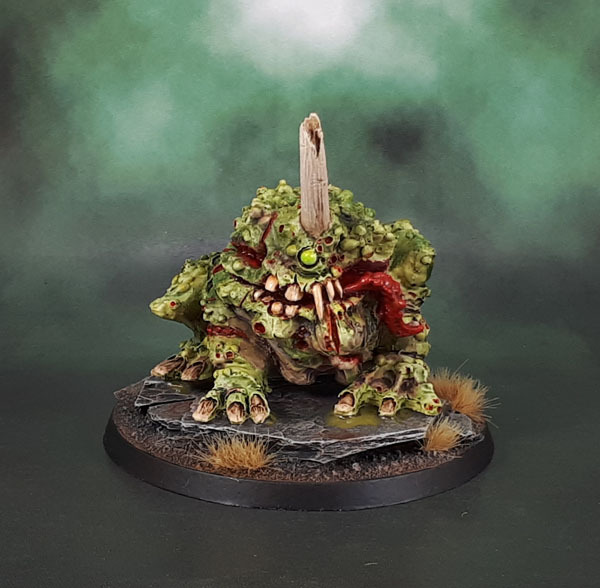 Since this year I’ve been doing the Nurgle Daemon thing, they finally got their time. 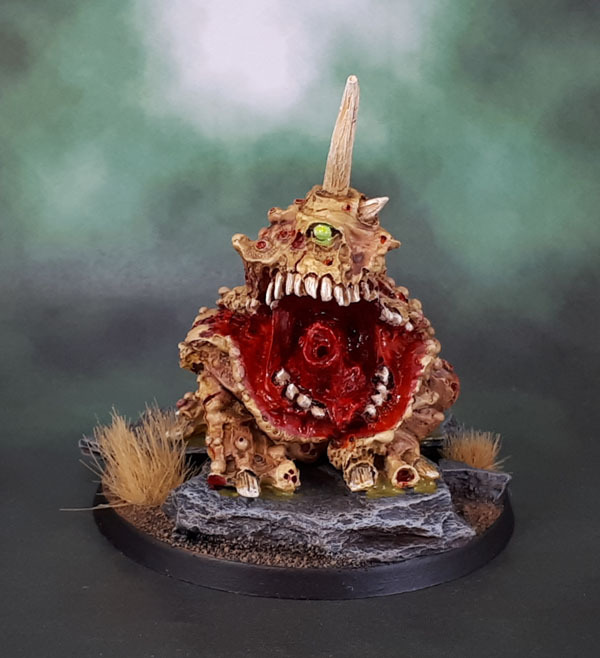 I still have a bunch of other metal Nurgle mobs to paint up before I allow myself to start on the plastics, but I’m allowing resin models to be painted thoughout. There’s not really a great deal to write about these things. 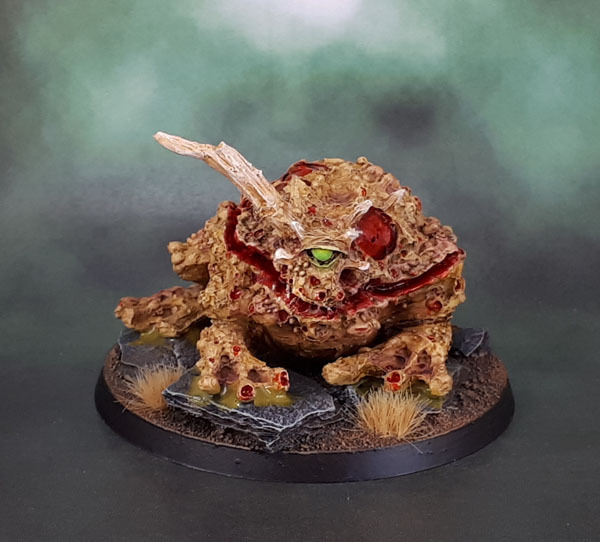 They’re pretty nifty in the current edition of 40k, and I assume quite nasty in AoS as well, though I honestly haven’t looked up their stats there yet. I’d have had these posted up earlier, but we’ve had an entire day and a half of rainstorms and occasional thunderstorms here, along with quite cold weather – which has meant a rather unsuitable climate for spraying. As we move into midwinter, that will of course only get worse, so I foresee a more sporadic posting schedule to come – where it will only be every few days (or on the weekends) I can manage to spray new models, so we’ll have “dead air” here on the blog while I wait for a suitable day and completed models pile up, followed by a mass of photos once I’ve had a spray day that gives me a backlog of stuff to spray. 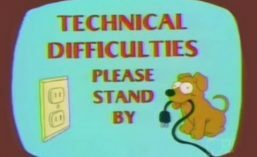 Depending on how that goes, I might end up doing some more “thought” pieces, like finishing that post about paints that sits half-finished in my drafts folder, or some painting tutorials (provided I can remember to take the photos. I still need to do one on iron/metal, and I’ve been thinking of documenting how I paint Isengard Uruk-Hai and their skin. Provided I start painting the bloody things! Here’s the usual size comparison shot, showing how they stack up to a couple of friends and a couple of foes. They’re pretty nice models, all in all – at least in that messed-up Nurgle way. They’ve also got a pretty impressive stature to them, and are quite a bit bigger than I’d expected when I first ordered them, oh so many years ago. 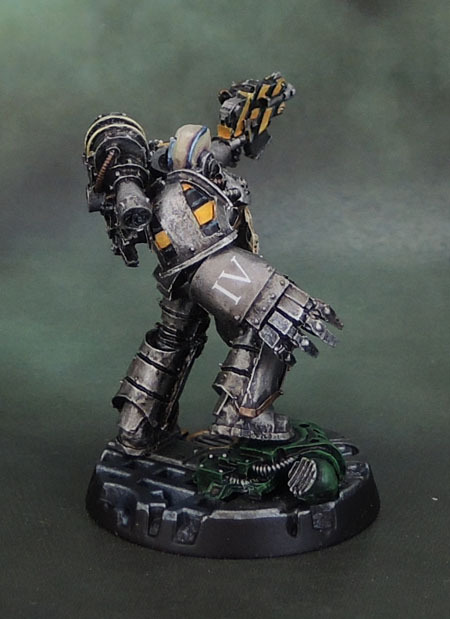 Today we have the Narik Dreygur Iron Warriors model from Forge World. 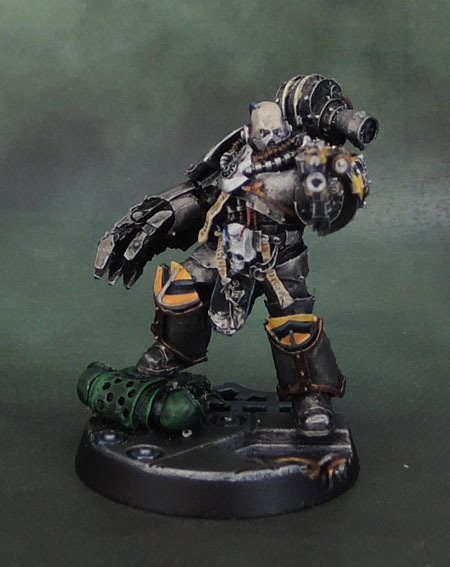 Nominally for 30k/HH, Narik, the “Gravewalker” was a renowned Iron Warriors commander during the Horus Heresy who eventually turned from the Traitors and became a loyalist and close confidant to the Salamanders – specifically, Cassian Dracos, the “Iron Dragon”. 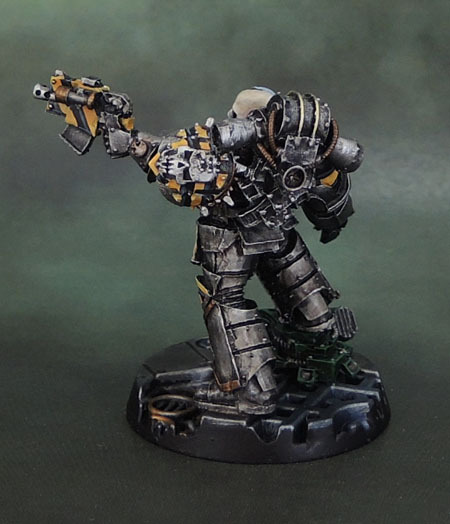 While my grand plan for my Iron Warriors force does include creating a decent element that will be 30k/40k compatible, I’m also realistic to know that my chances of ever playing 30k aren’t huge, so the main focus will be the 40k aspects. 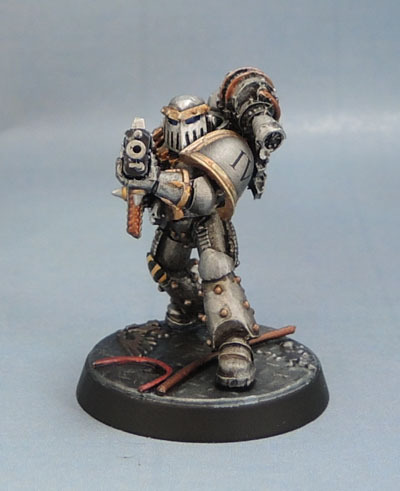 With that in mind, I’ve painted him following the same scheme as my 40k Iron Warriors. They’re pretty much the same between 30 and 40k, but perhaps a little more in terms of Hazard striping and in some cases copper/brass trim. 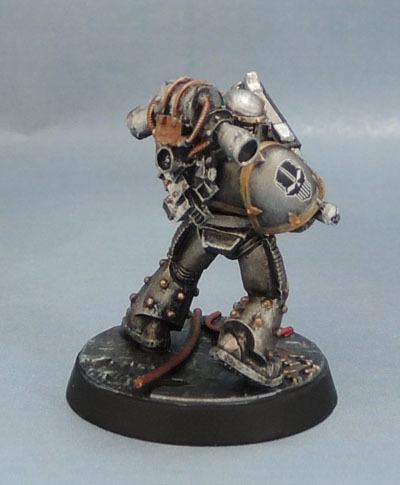 I considered going brass with his right shoulder, but felt it looked good in iron – and would probably look less good if I changed it, so it remained. My 40k IW retain the heraldry of the IV Legion, so Dreygur’s power fist seemed an appropriate place to stamp that firm. 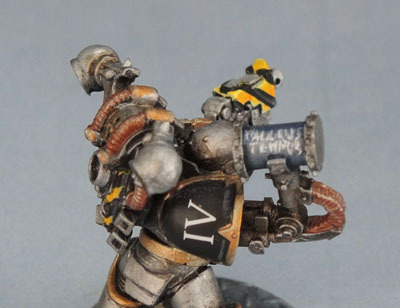 I gave him a not-Iron Warriors shoulder pad from Puppetswar, in Poland. They have some amazingly great designs, but when I ordered from them they were slow as molasses and the casting quality was nightmarishly bad to the point where they ended up having to replace most of my order – but only after I kicked up a huge public stink with the photos to the extent that they stopped posting on Dakka for a couple of years. I’ve not ordered from them since, so I don’t know if their casting quality and QA have improved, and I’m not that desperate to try again. I know they do occasionally send out freebies for review, and those models would obviously be lovely, cherry-picked casts. The backpack under his feet is painted in the dark green of my Dark Angels. I considered Minotaurs, but I felt that the brass of their armour would be too much metallic to add to the model, and not distinct enough from either Dreygur or his base, while their traditional foes, the Imperial Fists wouldn’t work well since I plan to eventually have only 1-2 squads of them, as opposed to the scores of Dark Angels I’ll eventually have painted up. While Dreygur is a named character in 30k, in my 40k force he’ll be used as an Exalted Champion, to run up alongside assaulters to help inflict those important close combat wounds (rerolling 1s to wound!) I might well keep the moniker of Nârik Dreygur, as I’m sure the IW would appreciate that kind of dark irony. So here we are. 400 posts since I started the blog in 2009. I only noticed that number in my dashboard a few minutes ago, so there’s no long, reflective post for it. I’ll try to be more aware when we get to 500 and do all of that stuff then. For today, we’ll get back to the models! 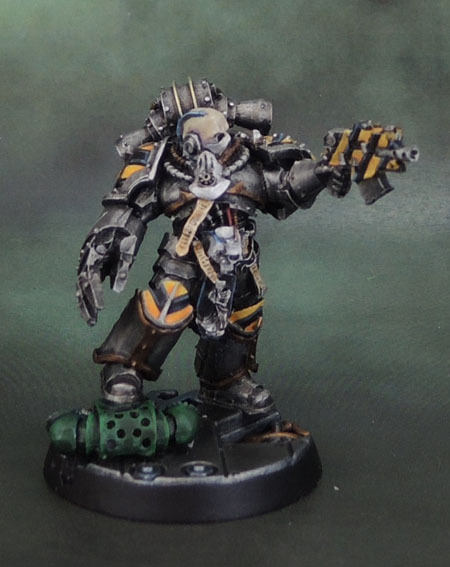 So that Iron Warriors “Tactical” squad that I got up to 9 guys last August? Well, I finally finished their 10th man. Because I’m fast and focused like that. I used a mix of parts, which was why I started buying “Historical” armour sets from Forge World in the first place, long before 30k was even a thing. It just took years for me to get interested in 40k enough to motivate me to finish the half-done squad, let alone build and paint the last man. My 40k Iron Warriors are going to be much more hybrids of 30k-and-up armour sets than Blanche’s early sketches of “Space Barbarian Vikings” covered in fur and horns and spikes. Those things might make an occasional subtle accessory appearance here and there, but they won’t be the main show. While I’m happy to add some decoration and flourish, I also want to keep them cold and businesslike. As always, transfers for the Chapter Badge and Legion Number, and freehand for the hazard striping. 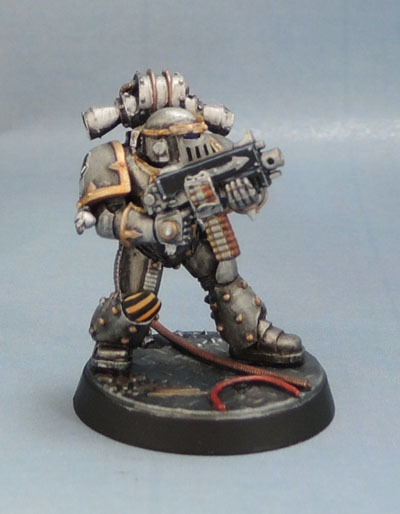 The other model today is “Hammer Time” from the Iron Warriors “Assault” Squad from a few months ago. D&B, Mikko and I had a brief discussion on the pun-tastic options for this guy and I eventually decided to do it. “Writing” legible script in paint at this size is always a challenge, and I found that using metallic paint (even really nice, thin, well pigmented stuff like VMA) to do so instead of black makes it all the more sketchy. Blown up like this, it looks a bit crap, but in hand it looks decent.